That’s right. I’m now set up for the new video teaching/chat service from Google called HELPOUTS. Whether you have a quick question, would like an occasional coaching, or are interested in traditional, weekly piano lessons, I‘m here to help. Spread the word! Google Helpouts has experts available on every subject/skill you can think of. It’s pretty cool. You can pay by the minute or in 15 minute increments. All you need is a piano and a webcam. Check it out. 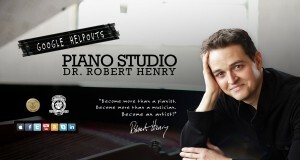 Topics can include anything piano-related, such as technique (scales, arpeggios, double-notes, chords, etudes), repertoire/interpretation, theory, history, memorization, performance skills/anxiety, competition/audition/performance preparation, practicing skills, concerti, chamber music, accompaniment, etc. I particularly enjoy helping pianists alleviate tension in their playing and avoid injury. I provide a comprehensive education in a healthy, encouraging environment. All ages and all levels welcome. Classical music only, please. Are you a teacher yourself, and have a question about teaching a particular piece or technique? I can help with that, too.